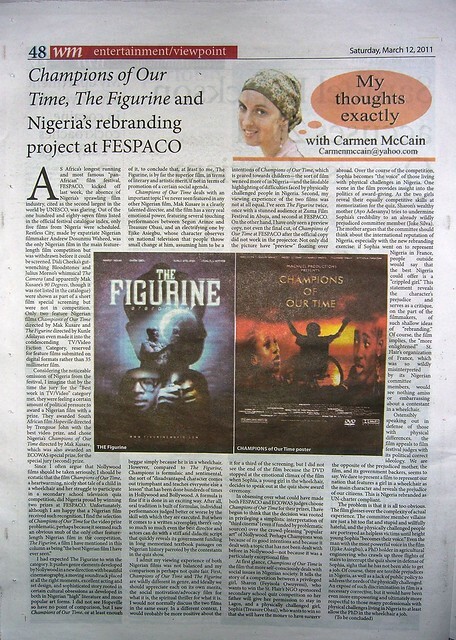 The past two weeks in my column “My Thoughts Exactly” in the Weekly Trust, I have briefly analyzed and compared the two Nigerian films, The Figurine and Champions of Our Time, that were in competition in the FESPACO Video Feature category. (The week before that I had talked about the politics of what FESPACO considers a film, in “FESPACO: Politics of Video and Afolayan’s The Figurine”). Champions of Our Time, directed by Mak Kusare, won the jury prize (second prize) in the category, as well as a special ECOWAS jury prize. I will copy the articles below (and will add the hard copy of this week’s article when I am able to find one. To read the hard copy, just click on the photo and it should take you to a version big enough to read.) To read on the Weekly Trust site, click here for Part 1, and here for Part 2. 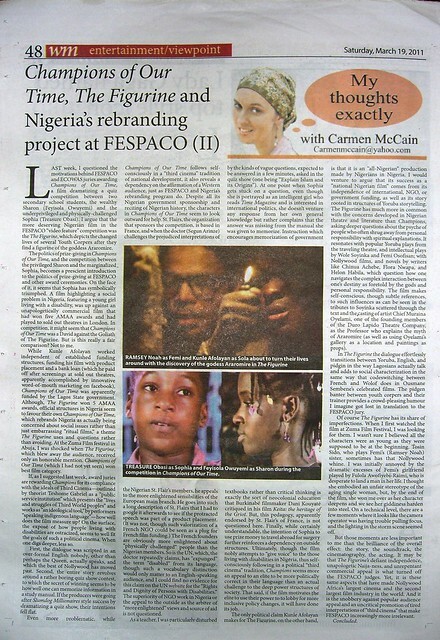 As Africa’s longest running and most famous “pan-African” film festival, FESPACO, kicked off last week, the absence of Nigeria’s sprawling film industry, cited as the second largest in the world by UNESCO, was glaring. Out of the one hundred and eighty-seven films listed in the official festival catalogue index, only five films from Nigeria were scheduled. Restless City, made by expatriate Nigerian filmmaker Andrew Dosunmu Waheed, was the only Nigerian film in the main feature-length film competition but was withdrawn before it could be screened. Didi Cheeka’s gut-wrenching Bloodstones and Julius Morno’s whimsical The Camera (and apparently Mak Kusare’s Duty [Please note this is a correction from my earlier mistake of identifying the film as Ninety Degrees, a feature length film directed in 2006 by Mak Kusare-CM 9/4/11], though it was not listed in the catalogue) were shown as part of a short film special screening but were not in competition. Only two feature Nigerian films Champions of Our Time directed by Mak Kusare and The Figurine directed by Kunle Afolayan even made it into the condescending TV/Video Fiction Category, reserved for feature films submitted on digital formats rather than 35 millimeter film. Considering the noticeable omission of Nigeria from the festival, I imagine that by the time the jury for the “Best work in TV/Video” category met, they were feeling a certain amount of political pressure to award a Nigerian film with a prize. They awarded South African film Hopeville directed by Trengoue John with the best video prize, and chose Nigeria’s Champions of Our Time directed by Mak Kusare, which was also awarded an ECOWAS special prize, for the special jury (second) prize. I had expected The Figurine to win the category. It pushes genre elements developed by Nollywood in a new direction with beautiful cinematography, a moving soundtrack placed at all the right moments, excellent acting and set design, and sophisticated story rooted in certain cultural obsessions as developed in both in Nigerian “high” literature and more popular art forms. I did not see Hopeville so have no point of comparison, but I saw Champions of Our Time, or at least enough of it, to conclude that, at least to me, The Figurine, is by far the superior film, in terms of literary and artistic merit, if not in terms of promotion of a certain social agenda. Champions of Our Time deals with an important topic I’ve never seen featured in any other Nigerian film, Mak Kusare is a clearly talented director, and the film has a very real emotional power, featuring several touching performances between Segun Arinze and Treasure Obasi, and an electrifying one by Ejike Asiegbu, whose character observes on national television that people throw small change at him, assuming him to be a beggar simply because he is in a wheelchair. However, compared to The Figurine, Champions is formulaic and sentimental, the sort of “disadvantaged character comes out triumphant and teaches everyone else a lesson” that has been done hundreds of times in Hollywood and Bollywood. A formula is fine if it is done in an exciting way. After all, oral tradition is built of formulas, individual performances judged better or worse by the skill with which they are executed. But when it comes to a written screenplay, there’s only so much so much even the best director and actors can do with a stiff and didactic script that quickly reveals its government funding in long memorized textbook passages on Nigerian history parroted by the contestants in the quiz show. I admit my viewing experience of both Nigerian films was not balanced and my comparison is perhaps not quite fair. First, Champions of Our Time and The Figurine are wildly different in genre, and ideally we should appreciate each on its own merits, the social motivation/advocacy film for what it is, the spiritual thriller for what it is. I would not normally discuss the two films in the same essay. In a different context, I would probably be more positive about the intentions of Champions of Our Time, which is geared towards children—the sort of film we need more of in Nigeria—and the laudable highlighting of difficulties faced by physically challenged people in Nigeria. Second, my viewing experience of the two films was not at all equal. I’ve seen The Figurine twice, once with a stunned audience at Zuma Film Festival in Abuja, and second at FESPACO. On the other hand, I have only seen a preview copy, not even the final cut, of Champions of Our Time at FESPACO after the official copy did not work in the projector. Not only did the picture have “preview” floating over it for a third of the screening, but I did not see the end of the film because the DVD stopped at the emotional climax of the film when Sophia, a young girl in the wheelchair, decides to speak out at the quiz show award ceremony. At first glance, Champions of Our Time is the film that more self-consciously deals with social issues in Nigerian society. It tells the story of a competition between a privileged girl, Sharon (Feyisola Owuyemi), who wants to win the St. Flair’s NGO sponsored secondary school quiz competition so her father will give her permission to stay in Lagos, and a physically challenged girl, Sophia (Treasure Obasi), who wants to win so that she will have the money to have surgery abroad. Over the course of the competition, Sophia becomes “the voice” of those living with physical challenges in Nigeria. One scene in the film provides insight into the politics of award-giving. As the two girls reveal their equally competitive skills at memorization for the quiz, Sharon’s wealthy mother (Ayo Adesanya) tries to undermine Sophia’s credibility to an already wildly prejudiced committee member (Joke Silva). 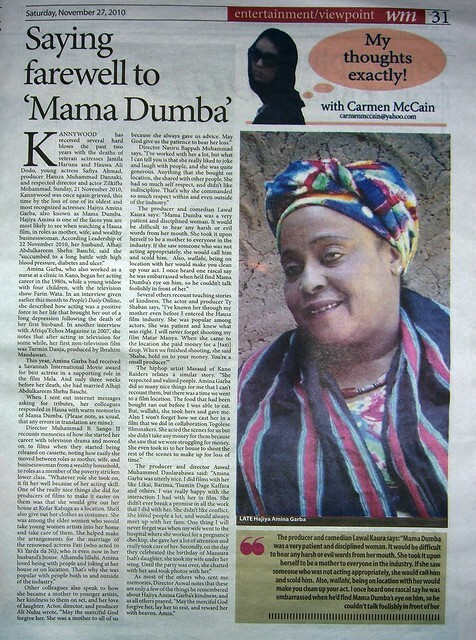 The mother argues that the committee should think about the international reputation of Nigeria, especially with the new rebranding exercise: if Sophia went on to represent Nigeria in France, people outside would say that the best Nigeria could offer is a “crippled girl.” This statement reveals the character’s prejudice and serves as a critique, on the part of the filmmakers, of such shallow ideas of “rebranding.” Of course, the film implies, the “more enlightened” St. Flair’s organization of France, which was so wildly misinterpreted by its Nigerian committee members, would see nothing amiss or embarrassing about a contestant in a wheelchair. Ostensibly speaking out in defense of those with physical differences, the film appeals to film festival judges with its political correct ideology. We are the opposite of the prejudiced mother, the film, and its government backers, seems to say. We dare to present a film to represent our nation that features a girl in a wheelchair as the main character and reveals the prejudice of our citizens. This is Nigeria rebranded as UN-charter compliant. The problem is that it is all too obvious. The film glosses over the complexity of actual experience. The committee member villains are just a bit too flat and stupid and willfully hateful, and the physically challenged people are portrayed as helpless victims until bright young Sophia “becomes their voice.” Even the man with the most powerful voice in the film (Ejike Asiegbu), a PhD holder in agricultural engineering who crawls up three flights of stairs to interrupt the quiz show in defense of Sophia, sighs that he has not been able to get a job. Of course, there are terrible prejudices in Nigeria, as well as a lack of public policy to address the needs of the physically challenged. An exposé of such discrimination in film is a necessary corrective, but it would have been even more empowering and ultimately more respectful to those many professionals with physical challenges living in Nigeria to at least allow the PhD in the wheelchair a job. Last week, I questioned the motivations behind FESPACO and ECOWAS juries awarding Champions of Our Time, a film dramatizing a quiz competition between two secondary school students, the wealthy Sharon (Feyisola Owuyemi) and the underprivileged and physically-challenged Sophia (Treasure Obasi). I argue that the more deserving Nigerian film in the FESPACO “video feature” competition was the The Figurine, which depicts the changed lives of several Youth Corpers after they find a figurine of the goddess Araromire. The politics of prize-giving in Champions of Our Time, and the competition between the privileged Sharon and the marginalized Sophia, becomes a prescient introduction to the politics of prize-giving at FESPACO and other award ceremonies. On the face of it, it seems that Sophia has symbolically triumphed. A film highlighting a social problem in Nigeria, featuring a young girl living with a disability, was up against an unapologetically commercial film that had won five AMAA awards and had played to sold out theatres in London. In competition, it might seem that Champions of Our Time was a David against the Goliath of The Figurine. But is this really a fair comparison? Not to me. While Kunle Afolayan worked independent of established funding structures, funding his film with product placement and a bank loan (which he paid off after screenings at sold out theatres, apparently accomplished by innovative word-of-mouth marketing on facebook), Champions of Our Time was apparently funded by the Lagos State government. Although, The Figurine won 5 AMAA awards, official structures in Nigeria seem to favour their own Champions of Our Time, which rebrands Nigeria as actually being concerned about social issues rather than just embarrassing “ritual films,” a theme The Figurine uses and questions rather than avoiding. At the Zuma Film festival in Abuja, I was shocked when The Figurine, which blew away the audience, received only an honorable mention. Champions of Our Time (which I had not yet seen) won best film category. If, as I suggested last week, award juries are rewarding Champions for its compliance with the ideals of Third Cinema—outlined by theorist Teshome Gabriel as a “public service institution” which presents the “lives and struggles of Third World peoples” and works as “an ideological tool,” by performers “speaking indigenous language”—how well does the film measure up? On the surface, the exposé of how people living with disabilities are ostracized, seems to well fit the goals of such a political cinema. When one digs deeper, less so. First, the dialogue was scripted in an over-formal English nobody, other than perhaps the Queen, actually speaks, and which the best of Nollywood has moved past. Second, the entire story revolves around a rather boring quiz show contest, to which the secret of winning seems to be how well one can memorize information in a study manual. If the producers were going after Slumdog Millionaires style success by dramatizing a quiz show, their intentions fell flat. Even more problematic, while Champions of Our Time follows self-consciously in a “third cinema” tradition of national development, it also reveals a dependency on the affirmation of a Western audience, just as FESPACO and Nigeria’s rebranding program do. Despite all its Nigerian government sponsorship and reciting of Nigerian history, the characters in Champions of Our Time seem to look outward for help. St. Flairs, the organization that sponsors the competition, is based in France, and when the doctor (Segun Arinze) challenges the prejudiced interpretations of the Nigerian St. Flair’s members, he appeals to the more enlightened sensibilities of the European main branch. He goes into such a long description of St. Flairs that I had to google it afterwards to see if the protracted speech was part of a product placement. (It was not, though such valorization of a French NGO could be seen as a plug for French film funding.) The French founders are obviously more enlightened about “physically challenged” people than the Nigerian members. So is the UN, which, the doctor repeatedly claims, has “expunged” the term “disabled” from its language, though such a vocabulary distinction would only matter to an English-speaking audience, and I could find no evidence for this claim on the UN website for the “Rights and Dignity of Persons with Disabilities.” The superiority of NGO work in Nigeria or the appeal to the outside as the arbiter of “more enlightened” views and source of aid is not questioned. As a teacher, I was particularly disturbed by the kinds of vague questions, expected to be answered in a few minutes, asked in the quiz show (one being “Explain Islam and its Origins”). At one point when Sophia gets stuck on a question, even though she is portrayed as an intelligent girl who reads Time Magazine and is interested in international politics, she doesn’t venture any response from her own general knowledge but rather complains that the answer was missing from the manual she was given to memorize. Instruction which encourages memorization of government textbooks rather than critical thinking is exactly the sort of neocolonial education that Burkinabé filmmaker Dani Kouyaté critiqued in his film Keita: the heritage of the Griot. But, this pedagogy, apparently endorsed by St. Flair’s of France, is not questioned here. Finally, while certainly understandable, the intention of Sophia to use prize money to travel abroad for surgery further reinforces a dependency on outside structures. 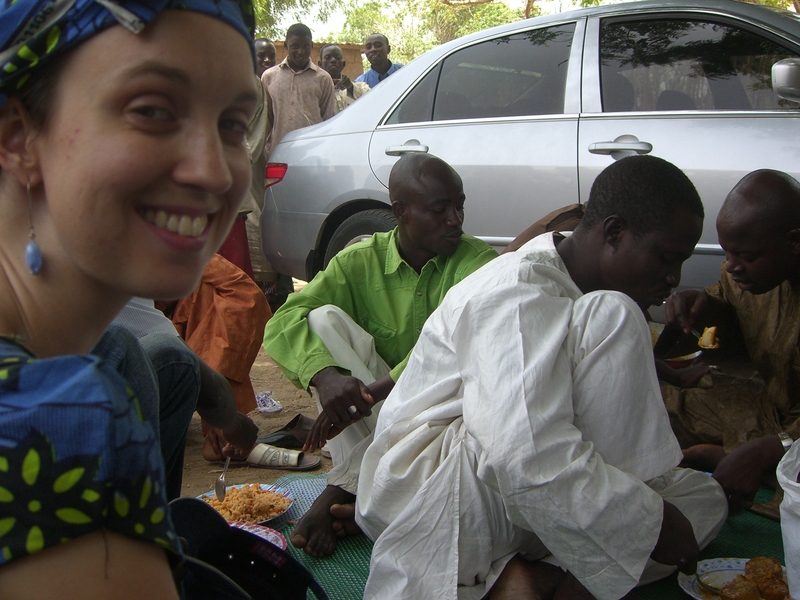 Ultimately, though the film nobly attempts to “give voice” to the those living with disabilities in Nigeria, thus self-consciously following in a political “third cinema” tradition, Champions seems more an appeal to an elite to be more politically correct in their language than an actual challenge to the deep power structures of society. That said, if the film motivates the elite to use their power to to lobby for more inclusive policy changes, it will have done its job. The only political claim Kunle Afolayan makes for The Figurine, on the other hand, is that it is an “all-Nigerian” production made by Nigerians in Nigeria. I would venture to argue that its success as a “national Nigerian film” comes from its independence of international, NGO, or government funding, as well as its story rooted in structures of Yoruba storytelling. The Figurine has much more in common with the concerns developed in Nigerian theatre and literature than Champions, asking deeper questions about the psyche of people who often shrug away from personal responsibility with spiritual explanations. It resonates with popular Yoruba plays from the traveling theatre, and intellectual plays by Wole Soyinka and Femi Osofisan; with Nollywood films, and novels by writers like Chinua Achebe, Flora Nwapa, and Helon Habila, which question how one navigates the complex interaction between one’s destiny as foretold by the gods and personal responsibility. The film makes self-conscious, though subtle references, to such influences as can be seen in the tributes to Soyinka scattered through the text and the casting of artist Chief Muraina Oyelami, one of the founding members of the Duro Lapido Theatre Company, as the Professor who explains the myth of Araromire (as well as using Oyelami’s gallery as a location and paintings as props). In The Figurine the dialogue effortlessly transitions between Yoruba, English, and pidgin in the way Lagosians actually talk and adds to social characterization in the same way that codeswitching between French and Wolof does in Ousmane Sembene’s celebrated films. The pidgen banter between youth corpers and their trainer provides a crowd-pleasing humour I imagine got lost in translation to the FESPACO jury. Of course The Figurine has its share of imperfections. When I first watched the film at Zuma Film Festival, I was looking for them. I wasn’t sure I believed all the characters were as young as they were supposed to be at the beginning. Tosin Sido, who plays Femi’s (Ramsey Noah) sister, sometimes has that Nollywood whine. I was initially annoyed by the dramatic excesses of Femi’s girlfriend played by Fulola Awofiyebi-Raimi, who is desperate to land a man in her life. I thought she embodied an unfair stereotype of the aging single woman, but, by the end of the film, she won me over as her character deepens and we see her giddiness harden into steel. On a technical level, there are a few moments where it looks like the camera operator was having trouble pulling focus, and the lighting in the storm scene seemed off. But those moments are less important to me than the brilliance of the overall effect: the story, the soundtrack, the cinematography, the acting. It may be that The Figurine’s defiant independence, unapologetic Naija-ness, and unrepentant commercial appeal is what turned off the FESPACO judges. Yet, it is these same aspects that have made Nollywood Africa’s largest cinema and the second largest film industry in the world. And it is the snobbery against popular audience appeal and an uncritical promotion of tired interpretations of “third cinema” that make FESPACO increasingly more irrelevant. 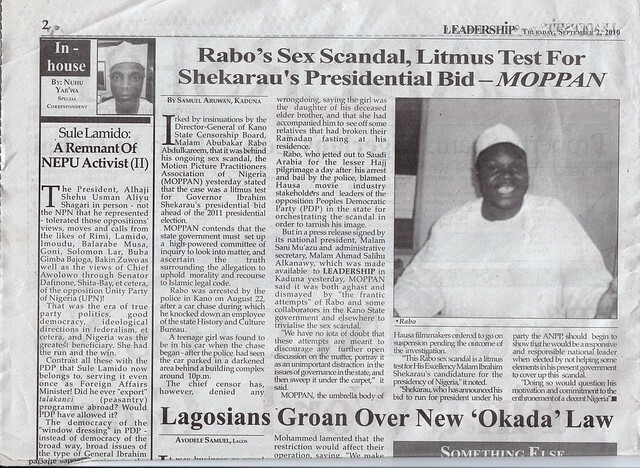 “Nollywood Goes Abuzz as ‘Champions of Our Time’ Premiers in Lagos” in Modern Ghana News, 26 November 2010. 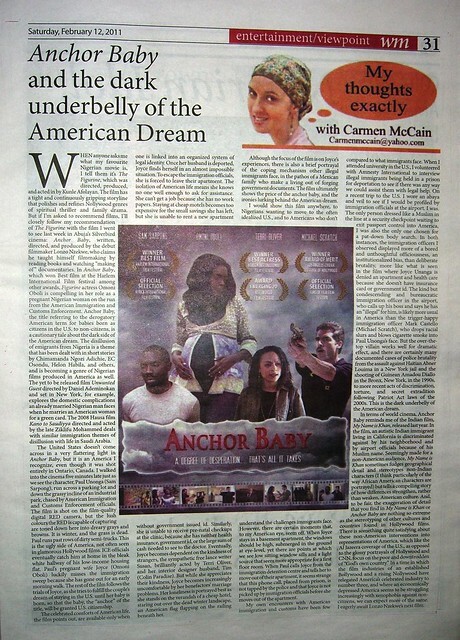 “‘Champions of Our Time’: Another Big Nollywood Movie Already Winning Awards” in Leadership, 5 December 2010. “Champions of Our Time is a Must See Nollywood Movie” in 24/7 Nigeria, 10 December 2010. “Champions of Our Time Wins Multiple Awards” in Supple Magazine, 10 December 2010. Inna Lillahi Wa’inna Ilaihir Raji’un. 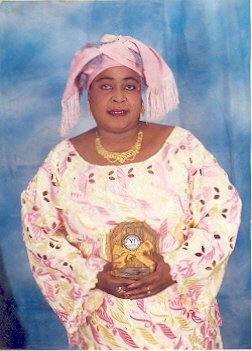 I signed onto Facebook tonight to the upsetting news of the passing away yesterday (21 November 201o, Sunday) of Hajiya Amina Garba, one of the most recognizable faces in Kannywood. 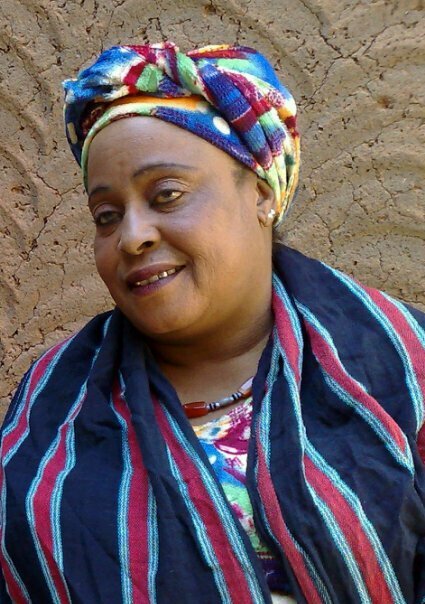 Hajiya Amina has played hundreds of roles over the years, most often as a mother. She died three weeks after her wedding, after a short illness. Allah ya jikanta. Allah ya sa ta huta. Allah ya ba mu hakuri. I do not have any of the details yet, but will post them as they become available. Kannywood Online has also posted a brief line on her death. If any of those of you who worked with her or knew her would like to share memories or stories about her for inclusion in my column this week, please share in the comments section or send me an email at carmenmccain [at] yahoo.com. Copied below is the article I published in honour of Hajiya Amina Garba on 27 November 2010, the week following her death. As I was out of the country at the time, I had to rely on email and facebook to gather tributes and memories. Unfortunately, that ended up meaning I had a pretty serious gender imbalance in what was published, but I still thought the memories shared by these directors, producers, actors, and musicians were quite poignant. Beneath the article, I have copied the full original messages in Hausa that were sent to me by Kannywood stakeholders in response to my call for written memories about Hajiya Amina. I have also included a couple of tributes from people who responded after my submission deadline and I wasn’t able to include in the publication. To read the article, just click on this link to the soft version on the Weekly Trust site or on the photo, and it will redirect you to a large readable version hosted on my flickr site. Abba El Mustapha, Producer, Actor: salam, innalillahi wa inna ilaihirrajiun. haj. amina has passed away but her memories will never fade. a woman of honest, integrity, charismatic n always down 2 all. a mother to all that we shall always cherish her kind gesture n modesty. may her gentle soul rest in perfect peace. Ali Nuhu, Director, Producer, Actor: Zan fara da cewa Allah ya jikanta ya gafarce ta. Ta kasance Uwa ga dukkanmu don kullum tana cikin bada shawara ta gari garemu. Allah ya bamu hakuri da danganar rashin ta. 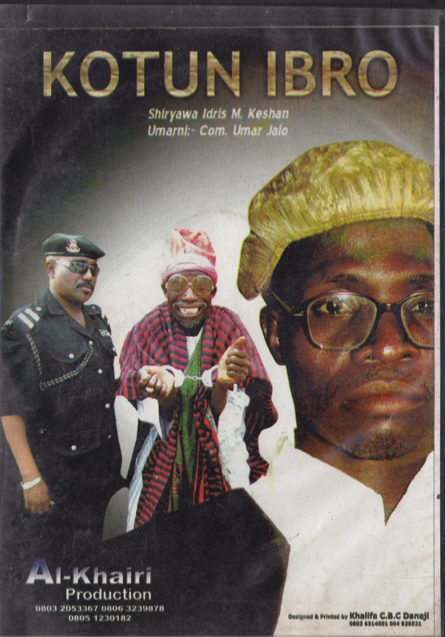 Lawal Kaura, Director, Producer, Actor: Abin da na sani a halayen ta ni a kashin kaina sune, mama dumba mace ce mai hakuri da kamun kai da kuma kawaici, dan zai wahala ka ji wasu munanan kalmomi sun futo daga bakin ta, bugu da kari kuma ta dauki kanta tamkar uwar kowa a industry idan taga mutun yana aikata ba daidai ba ita sai ta kira shi tai masa fada. Haka yasa wallahi idan location da ita za kaga ya zama mai tsabta, dan han na taba ji wani shakiyi yana cewa shi yana kunyar idon mama dumba dan haka ko maganar banza baya iyawa. Allah ya gafarta mata ya jikan ta ya kuma kyautata tamu in tazo. Muhammad B Sango II, director: Talatu,Amina Garba ta fara harkar fim tun daga gidan Talabijin inda ta ke yin wasan kwaikwayo kuma a nan ne aka fara saninta.Ta bayar da gudummawa sosai wajen cin nasarar wasan kwaikwayo a talabijin domin a lokacin sune ‘yammata. A lokacin da aka fara Fina-finan Hausa a kaset kuwa,su ne iyaye mata kuma a nan mata yi fice sosai musamman a wajen fitowa a matsayin matar Attajiri ko ita kanta Attajira. Ta kan fito kuma a matsayin talaka, amma duk rawar (role) da ta taka yana dacewa da ita sosai saboda kwarewarta. Babban abin kirkin da ta kan yiwa masu shirya fim(Furodusa) shi ne ta kan bayar da gidanta na Kofar Kabuga domin lokeshin (location) domin saukaka musu kuma ta bayar da kayan sawarta (costumes) a yi amfani da su. Kuma ya na cikin tarihi (on record) cewar tana daya daga cikin mata manya wadanda su ke ajiye ‘yam mata ‘yan fim a gidajensu su na kula da su kuma ta hannunta ta aurar da fitacciyar jarumar fim din (Ki yarda da ni) Fati wacce har yanzu ta na gidan mijinta, Alhamdu lillahi. Amina ta na da son jama’a da barkwanci a gida ko a lokeshan shi ya sa ta ke da tagomashi a tsakanin jama’a a waje da cikin industry. Kadan kenan daga abin da zan iya fada miki Talatu. Na gode. Nasiru Bappah Muhammad, Director: Nagode da sakon ta’aziya, kuma kin kyau da za ki yi tribute to Amina Garba. Ni mun yi aiki da ita sosai amma abin da zan iya fada miki shine tana da wasa da dariya da jama’a, kuma tana da kyauta. Komai ta saya on location, she shared with other people. She had so much self respect, and didn’t like indiscipline, that’s why she commanded so much respect within and even without the industry. Shaban Ty, Producer, Actor: Nasanta tare da mahaifiyata tun kafin na shigo hausa fim industry,tanada farin jini wurin yanwasa,hakuri da sanin yakamata.bazan manta shooting dina na fimdin matar manya ba, inda tazo location ta biya kudin drop na mota mukayi shooting muka gama tace shaba ka rike kudinka kai karamin producer ne.ALLAH YAJI KANTA DA RAHAMASA. Here is the second week of my column, published on page 29 of Weekly Trust. The title I submitted was “Questioning Love,” which I prefer a bit more than “Questioning Love of the Hausa kind” because part of my point was that love stories universally often pose questions to the larger society. 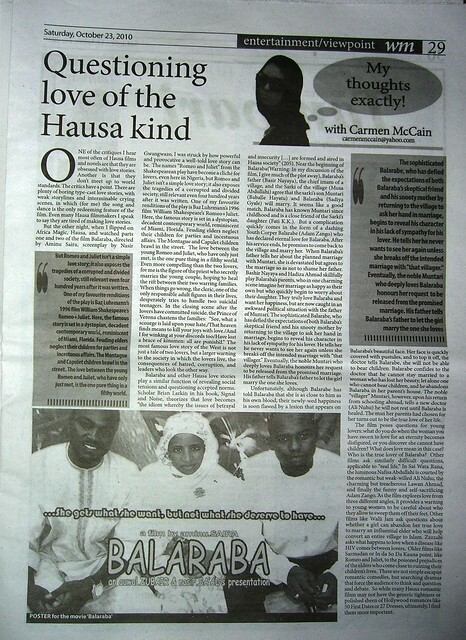 I briefly discuss Shakespeare’s play Romeo and Juliet in its Baz Luhrman incarnation, and then move on to a discussion of Hausa love films, focusing on the film Balaraba, directed by Aminu Saira, screenplay by Nasir Gwangwazo, and starring Sadiya Gyale, Adam Zango, and Baballe Hayatu. To read the article on the Weekly Trust site, click on this link. To read the article in it’s original version, click on the photo. Your cursor should show the sign of a magnifying glass. Click on the photo again and it will expand to a large readable version. Let me know if you have any problems reading. To watch the trailer for Balaraba, scroll down below the photo, or click here.